Can existing radiochemistry methods effectively measure the radioactivity in fracking flowback water? 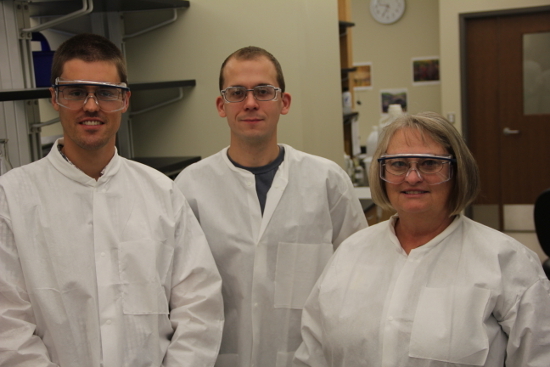 The Hygienic Lab's Rad Chem section partnered with a UI research team to find out. 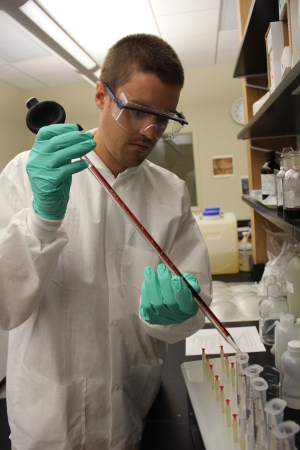 UI graduate fellow Andrew Nelson works on the fracking flowback water project in the Hygienic Laboratory's Radiochemistry lab. Hydraulic fracturing, or fracking, is a controversial process that injects fluid into wells, creating cracks that allow for oil or gas previously unreachable to be extracted. When the fracking fluid, known as flowback water, comes up to the surface, it may bring naturally occurring radioactivity that can contaminate drinking water. Little is known about the effect of flowback water on the environment, including the potential threat from radiation exposure. Michael Schultz, Ph.D., UI professor in Radiology and Radiation Oncology, suspected that flowback water would contain high levels of radium that could potentially result in undesirable environmental impact and present significant waste disposal challenges. Realizing a need for a quick screening method, Schultz approached Marinea Mehrhoff, supervisor of Radiochemistry, to assist in measuring radiation in this new type of medium. Andrew Nelson, recipient of a UI Presidential Graduate Research Fellowship and a graduate student working with Schultz, collaborated directly with Mehrhoff to investigate the effectiveness of traditional methods. According to Mehrhoff, this was her most complex collaboration with a researcher to date. In May, the Hygienic Laboratory received a 55-gallon drum of fracking flowback from the Marcellus Shale region in northern Pennsylvania. The sample was initially analyzed to determine the composition of the fluid. Due to the presence of interferences, a surrogate matrix was created to represent the metal and mineral composition of the original fluid. Andrew Nelson (left) worked with Dustin May, environmental lab analyst, and Marinea Mehrhoff, supervisor of Radiochemistry, on the project. After four months of trial and error, and consultations with Schultz and other national subject-matter experts, Mehrhoff and Nelson formalized and validated two techniques by performing 62 analyses in less than two weeks to meet the project deadline. The use of gamma spectroscopy is not new, but optimizing the software settings, calibration range of energy, interference in the spectrum and the list of isotopes and associated values are different than traditional settings, Mehrhoff explained. The analyses resulted in significant findings. The most prevalent isotopes [of radium] identified were 226Ra at 17,027 pCi/L and 228Ra at 1,945 pCi/L. For comparison, Maximum Contaminate Level for combined 226Ra and 228Ra in drinking water is 5 pCi/L. While these levels are above what is normally allowed as discharge into surface water, the study also showed that interferences in the chemistry require a need for different methodology. "We are finding that the levels of barium, calcium and dissolved solids in the sample interfere with methods traditionally used for drinking water analysis," said Nelson. "As states are beginning to make decisions on how to regulate waste from unconventional drilling and hydraulic fracturing, they will need to ensure the methods employed are appropriate." Schultz and Nelson are preparing to publish the results, along with their recommendations for methodology using high purity germanium gamma spectroscopy or radon emanation methods. "We expect these studies to contribute to state public health labs and other research groups,” Nelson said, “so that we can be certain that the levels of radium reported in drilling waste are accurate."